Removing a field from a roadmap and deleting a field from your account are two different things. 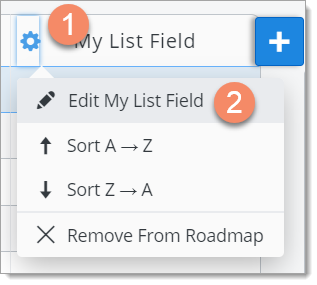 When you remove a field from a roadmap, all the values for the field are deleted from the roadmap and any views that use the field to filter or pivot data are affected. The removed field is NOT deleted from the account and can continue to be used in roadmaps. When you delete a field, the field is deleted permanently from your Roadmunk account. 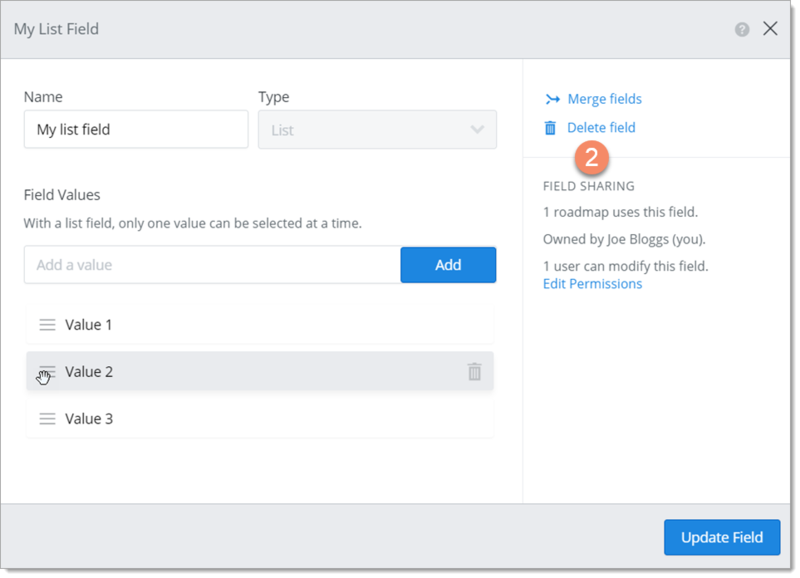 The field is deleted from all roadmaps that are using it and any views that use the field to filter or pivot data are affected. All the item values for the field in all the roadmaps are deleted as well. For more details, see What happens when you delete a field? a the end of the article. You remove a field from a roadmap in the Items Table. To open the Items Table, click Items on the View navbar. 1. In the Items Table, mouse over the field's header and click the Cogwheel icon. 2. In the dropdown, select Remove From Roadmap. IMPORTANT: When you remove a field from a roadmap, you DO NOT delete the field from your account and it can continue to be used in roadmaps. However, you DO delete all the values for the field in the roadmap. Who can remove fields from a roadmap? To remove a field from a roadmap, you must be the roadmap's Owner OR the roadmap must be shared with you as an Editor. If a roadmap has been shared with you as Viewer, you can't remove any fields from it. You delete a field from your account in the field card. 2. In the dropdown, select Edit field. 2. In the field card, click Delete field. 3. In the Delete field dialog, click inside the text box and type DELETE THIS FIELD. WARNING: Before deleting the field, read What happens when you delete a field? below. What happens when you delete a field? The field is deleted permanently from your Roadmunk account, which means it's also deleted from any roadmaps in your account that are using it. 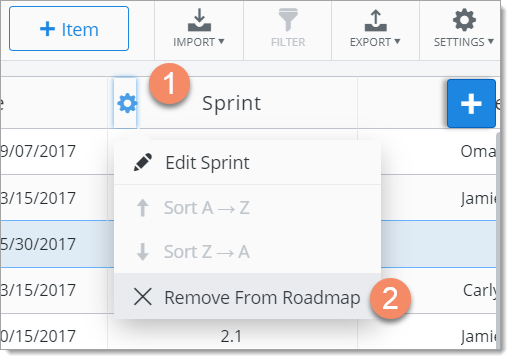 When the field is deleted from a roadmap, all the values in the roadmap assigned to that field are deleted as well. This data can't be recovered. 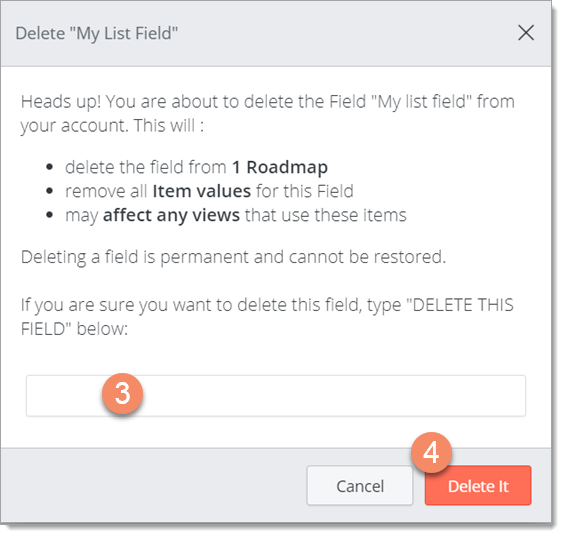 Any filters or data pivots in an affected roadmap that use the field are deleted as well. Who can delete a field? Because deleting a field has such a big impact, only field Owners can delete a field (see Add field Editors and change field permissions).